But Desired the Hearts of His Co-servants." "Though I speak with the tonguesЙ of angelsЙ And though I have the gift of prophecy, and understand all mysteriesЙ and though I have all faithЙ And though I bestow all my goods to feed the poorЙ and have not charity, I am nothingЙ Charity suffereth long, and is kind; charity envieth not; charity vaunteth not itself, is not puffed upЙ seeketh not her ownЙ thinketh no evil" (from St Paul's Epistle to the Corinthians, Chapter 13). Today's funeral is a testament to the power of love. The burial service of newly-departed Vladyka Anthony is being held far from his diocese, yet such a large number of clergymen and faithful have gathered in this church, that this monastery church can barely accommodate everyone. Hearing of the death of Vladyka Anthony, those who could left school, left work, some even traveled from other continents to participate in seeing off this humble and loving archpastor. We came not because we were issued a directive, not so that we could show up for the sake of formality, but the heart of Vladyka drew us here. Today's gathering of faithful for the burial of Archbishop Anthony is a tiny echo of our love to his love. Love for God is the main driving force of the late Vladyka, this true monk, this man of poverty, this man of prayer. Since the days of his youth he preferred the laws of God, as we heard in today's kathisma, "more than gold and topaz." Usually one recounts a person's life achievements during his funeral. We can say a great deal about this, but it is more important, more appropriate to speak of how much Vladyka loved. How he loved the Lord. He did not know the words "I" or "mine." For him, all belonged to God. He also loved the divine services. For him, divine services were truly heaven on earth. How Vladyka Anthony loved this icon here today, the Kursk-Root Icon of the Mother of God, the Protectress of the Russian diaspora. When the Icon would come to San Francisco, he greeted not simply an icon, but the Mother of God Herself. And how he would prepare for Her arrival! In the Icon he palpably sensed the present of the Most-Holy Mother of God Herself, and his face changed from joy and endearment. How he loved his brother archpastors! His last few months, he lived with one desire only—to last until the October Council of Bishops, so that he could see his brothers for the last time, to bid farewell to them. How he loved Archbishop Laurus, how he loved this monastery and seminary! He wished that all the priests in his diocese had been graduates of Holy Trinity Seminary. Vladyka often remembered the words of Metropolitan Anastassy of blessed memory that Jordanville was our "spiritual fortress." Vladyka Anthony did not seek formal obedience, he desired the hearts of his co-servants. On the day of his consecration, Vladyka Anthony prayed for the granting to him of empathetic love for his future clergymen and flock, so that "the hearts of the clergy and flock would be given to me, but given to me so that they could be brought to Christ, the Chief Pastor." How Vladyka loved the parishioners of our Cathedral, how he loved the altar boys and choir singers, the hierarchal choir, how he loved the conductor, Vladimir Krassovsky, he loved the youth choir, loved the children's choir! How Vladyka loved and remembered the children—Misha and Tasya, Alyosha and Ksenia, Roman and AlexandraЙ A priest has six children, and Vladyka remembers each and every one, he would call each one on their namesday, he remembered every clergyman and their matushkas and the parishioners on their namesdayЙ When we saw off Archbishop Anthony in San Francisco, everyone approached the coffin in absolute silence, there was not a single sound, and children cried more than anyone. How Vladyka Anthony loved our Russian Church Abroad! Many of you met Vladyka only a few times, but even one meeting was enough to warm a person's heart. Upon meeting Archbishop Anthony, people sensed in him the light of Christ, and this light brought warmth, joy and hope to our lives. The repose of Archbishop Anthony is not only a loss for each of us personally, but a loss for our entire Church, for Russia, for Universal Orthodoxy. Archbishop Anthony did not look narrowly upon the Church, his heart was open for all Orthodoxy, especially where there was suffering, especially in Russian and Serbia. In this regard his attitude was similar to that of Metropolitan Anthony (Khrapovitsky) of blessed memory and St John of Shanghai and San Francisco the Miracle-worker. Vladyka Anthony was a hierarch of universal significance. When Vladyka Anthony lay in the hospital during his last few days, besides his service books—the Gospel, the prayer book, the Menaion—he asked for the biography of Metropolitan Anthony of blessed memory, 6 or 7 volumes. It was those specific volumes that speak of the division in the Russian Church. Vladyka Anthony sought a way to overcome this division, which he profoundly grieved over. Vladyka Anthony served his last liturgy on the feast of the Transfiguration of the Lord. After service, he appealed to his flock in connection with the glorification in Moscow of the Royal Martyrs. Vladyka approved of this glorification and rejoiced. He said that despite our differences, the glorification was a beginning, it was reason for hope. I think that Archbishop Anthony was the last hierarch of our Church who was born in Russia, and adopted the monastic form of life at an early age, and knew the great father Metropolitan Anthony. Vladyka Anthony especially loved Archbishop Vitaly (Maximenko) of blessed memory. Archbishop Anthony had a living sense of these two great bishops, and in part, thanks to his closeness to them, manifested in himself the genuine spirit of the Russian Orthodox Church Outside of Russia. Vladyka Anthony was respected by all other bishops who came to know him, and this respect was projected onto our entire Russian Church Abroad. I found a letter from a professor in Yugoslavia, a personal friend of His Holiness Patriarch Pavle. He wrote: "Patriarch Pavle told me that he visited your home [in San Francisco—ed. ], and that Archbishop Anthony was a great man of prayer!" 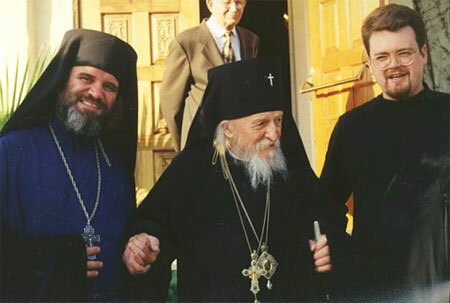 Sensing that his earthly life was approaching an end, Vladyka Anthony appealed to the clergy of the Western American Diocese after divine liturgy during the Pastoral Retreat during Great Lent in 2000 with the following words: "I thank you for everything, for covering my sins with your love, your prayers. And I ask that you graciously forgive me. I thank God that He gave you to me. I desire that you should preserve the Local Russian Church, of which we are a part, that you preserve all the Orthodox Churches which suffer so, especially the Serbian Church, to which we are so indebted and which we, too, helped. Let us pray to God that He would proclaim His Truth in His world. Let us pray for everyone. Confirm, God, the holy Orthodox Church, which You built with your blood. This is my wish at this pastoral meeting, blessed by prayer and confession." When I read the Gospel over the coffin of the late Vladyka Anthony, a few words found a special place in my heart. These are from the parable of the ten maidens, when the foolish had no oil and asked of the wise: "Give us of your oil." Dear Vladyka, thank you for everything, forgive us, pray for us and give us of your oil. Amen. On September 23, at 12:10 pm, the Ruling Archbishop of the Western American Diocese of the Russian Orthodox Church Outside of Russia, His Eminence Archbishop Anthony, died. Vladyka Anthony led the Western American Diocese over the course of 32 years—not one Orthodox bishop in the USA held a cathedra for such a long period of time. With the death of Archbishop Anthony, one of the last threads connecting us to pre-revolutionary Russia has been broken, a bond to the tradition of old Russian monasticism, with a direct succession of the spirit of the founders of the Russian Orthodox Church Outside of Russia. Archbishop Anthony was the last bishop of the Russian Church born and raised in pre-revolutionary Russia, having assumed the monkhood at an early age, and who knew the great abba, Metropolitan Anthony (Khrapovitsky) of blessed memory. Thirty-two years ago, on the Veneration of the Cross during Great Lent, Vladyka Anthony, newly appointed by the Council of Bishops, arrived from Australia. There were 16 parishes in the Western American Diocese at the time. The Parish of the Catheral had not yet recovered from the difficult period of the construction of the new church. In the 1960's, the Diocese was divided into two parts, the Western American Diocese and the Southern Californian Diocese. There were a few parishes directly subject to the First Hierarch of the Russian Orthodox Church Outside of Russia. There were two cadet organizations and two scout organizations. With the arrival of His Eminence Archbishop Anthony in San Francisco, a period of healing, a period of the restoration of peace and unity began. Metropolitan Anastassy (Gribanovsky) of blessed memory would speak of the main, brightest and most endearing trait of Archbishop Anthony, his love: "It makes peace among those who quarrel and softens angry and spiteful hearts, it acts upon them like a balm poured into roiling seas." Metropolitan Anastassy was not mistaken. Over those 32 years, the Western American Diocese became one of the most well-organized in the Russian diaspora. A period of peaceful and amicable constructiveness began at the Cathedral. Under Archbishop Anthony, the construction and frescos were completed, and the Cathedral consecrated. The parish built a new hall with premises for the SS Cyril and Methodius High School. The number of parishes grew to 35. A series of English-language missions was established in the Diocese, a hospital for the aging and the first Orthodox "lycee," in honor of St John of Shanghai and San Francisco the Miracle-worker. The Southern Californian Diocese was attached to the Western American Diocese, the two cadet organizations merged, the scout organizations did as well. So many prayers, so much love, patience, wisdom and humility was needed from Archbishop Anthony to heal the wounds, to unite everyone, and then to maintain peace and unity! The Russian writer Vladimir Soloukhin, describing his first meeting with Archbishop Anthony (see the story "Plokhoi soborЙ" [Bad Council] in the anthology Smekh za levym plechom [Laughter Over the Left Shoulder]), wrote: "The doors opened [to the residence of Vladyka Anthony—P.P.] and I saw a gray-haired, gray-bearded elder, opening his arms as though to embrace me, as though a father to his prodigal son." This is how Vladyka Anthony greeted everyone who came to seek his counsel. Archbishop Anthony, born Artemii Sergeevich Medvedev, was born in 1908 in Vilnius and studied at the Petrovsky Poltavsky Cadet Corps. During the Civil War, he was evacuated from Sevastopol to Yugoslavia, where in the White Army he finished the Crimean Cadet Corps of the White Army. At the age of 22, he entered the Entrance of the Mother of God Monastery. He considered himself a student of the Superior of Milkovo Monatery, Schema-Archimandrite Ambrosius (Kurganov), of which he wrote the work "Nemnogoletnii starets" [Young elder] (Pravoslavniy put', 1952). In 1932, the future Archbishop Anthony was tonsured into the monkhood, in 1934 ordained a hierodeacon, and in 1938, a hieromonk. In Milkovo, Fr Anthony bore the duty of ecclesiarch. During World War II, Hieromonk Anthony was a military chaplain in the Russian Corps and the Russian Liberation Movement. In the interim, he found himself at the Monastery of St Job of Pochaev in the Carpathian Mountains. Since then, Fr Anthony developed a strong bond with that brotherhood. After the war, Fr Anthony moved with the brotherhood to Holy Trinity Monastery in Jordanville, NY, where he fell under the spiritual leadership of Archbishop Vitaly (Maximenko), who led him to missionary work. Heguman, and later Archimandrite, Anthony opened a series of new parishes in places where Russian refugees gathered, and also temporarily served as administrator of the parishes of Western Canada. In 1956, Archimandrite Anthony was consecrated Bishop of Melbourne, Vicar of the Australian Diocese. In Australia, he was especially close to the famous Russian liturgist Protopriest Rostislav Gan, and also to the future First Hierarch of the Russian Orthodox Church Outside of Russia, Metropolitan Philaret (Voznesensky). After the repose of Archbishop John of Shanghai and San Francisco the Miracle-worker, the vacant Western American cathedra was filled by Bishop Anthony. In 1968, he arrived in San Francisco and that same year was elevated to the rank of archbishop. Wherever he served, Vladyka Anthony paid special attention to work with young people and parish schools. From 1978 on, Vladyka Anthony was a member of the Synod of Bishops and helped organize Councils of Bishops. As hegumen and archimandrite, he prepared and edited the Typikon with instructions for divine services—the addendum to the Holy Trinity Monastery Calendar. He was a magnificent scholar of the church Ustav (Rule of services) and divine services and as instructed by the Synod of Bishops, he prepared texts for the services for St Herman of Alaska, St John of Kronstadt (together with St John of Shanghai and San Francisco the Miracle-worker), and the prayer to All Russian Saints, and St Blessed Xenia of St Petersburg. Archbishop Anthony wrote the entire service to the New Martyrs and Confessors of Russia. Archbishop Anthony will be noted by history as the main inspiration for the glorification of the great saint of the 20th century, St John of Shanghai. 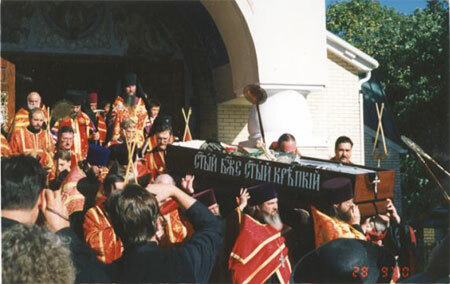 Vladyka Anthony headed the examination of the remains of St John in 1993, and also performed all the preparations for his glorification, including composing most of the service to St John. At the end of 1999, Archbishop Anthony's health began to falter. Vladyka did not spare himself for the sake of the Church, and ignored his weakness until he could no longer walk and read without great difficulty. The Synod of Bishops granted him leave of absence starting on January 1, 2000, in order to regain his health, and the temporary administration of the Western American Diocese was given to Bishop Kyrill of Seattle. During his treatment, Vladyka Anthony still tried to attend all the main church services. He conducted all the services of Passion Week and Pascha that year. Despite his poor vision, he read the divine services, often by heart. After Pascha, Vladyka Anthony was hospitalized for extended treatment, and since then often lay in the hospital or in bed at home. He performed his final service on the Transfiguration of the Lord—his physicians allowed him to travel to the church from the hospital that day. He prepared himself all week for the service, thinking about how he would perform liturgy in a wheelchair (he was no longer able to walk then), and when he would rise to his feet. The Cathedral decided to celebrate his recent namesday on the day of the Transfiguration. There were no words to describe the joy Vladyka Anthony felt in seeing his flock and serving divine liturgy. After liturgy and a moleben to St Anthony the Roman, a trapeza was held during which Vladyka heard congratulatory greetings. That evening he returned to the hospital. At the beginning of September, Archbishop Anthony was released to return home. 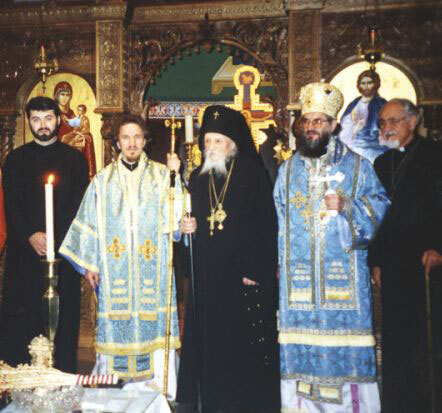 On September 10, on the day of St Job of Pochaev, Archbishop Anthony attended service at the Cathedral. He prayed at early liturgy and communed of the Holy Gifts, then venerated the icon of St Job and the relics of St John, turned to his flock and left the Cathedral. After liturgy, the doctor, examining the feet of Vladyka Anthony, said that he must immediately go to the hospital, or he would die of gangrene. Vladyka Anthony decided to wait, however, to hear on the speakers wired his room the remainder of the all-night vigil on the eve of the feast day of the Beheading of St John the Baptist, and after liturgy on September 11, which he also listened to, he was taken to the hospital. Vladyka Anthony's health weakened every day. He tried to conceal his great pain, but it was apparent to his visitors. Archbishop Anthony's spiritual father, Protopriest Stefan Pavlenko, administered Communion to him on Tuesday, September 19, and the last three days, one or another of his clergy spent all night in Vladyka's hospital room with him. On Thursday, Vladyka Anthony's condition worsened drastically, he reacted little to his visitors, and concentrated on his condition. On Friday, September 22, at around 11 pm, Vladyka Anthony received Christ's Mysteries for the last time. His breathing was very labored. Two priests read the Canon on the departure of the soul from the body, as the parishioners of the Cathedral who had gathered sang. After the canon, those present sang Vladyka's beloved Sticherion of the Cross, and a tear welled up in his right eye—he heard and understood everything! Then they bid farewell to their archpastor, asking his forgiveness and blessing, kissing his hand. Priest Alexander Krassovsky spent that night in Vladyka's room, and the next morning, Protopriest Mark Gomez relieved him, in whose arms, at noon, the Ruling Archbishop of the Western American Diocese died peacefully. Word of Vladyka's repose was immediately sent to the Cathedral's clergy. It was a school day, and the students of SS Cyril and Methodius High School, whom Vladyka loved so much, learned of his death first. The High School hosted the very first service for the repose of the newly-departed Archbishop Anthony. By 1 pm, five priests already gathered at Vladyka Anthony's bedside and the Canon for the departure of the soul from the body was conducted, and then Vladyka's body was taken to the Cathedral. At 5 pm, Bishop Kyrill, Protopriest Stefan Pavlenko and Priest Paul Volmensky arrived from Reno (where that day the first hierarchal liturgy was performed in the new mission of the Russian Orthodox Church Outside of Russia) and together with the Cathedral's clergymen, they vested Vladyka Anthony into his monastic garb and the minor Episcopal vestments. After all-night vigil, attended by a great number of parishioners who had already learned of Vladyka's death, the first pannikhida service was conducted. All night, the Cathedral's parishioners read the Psalter over the body of the newly-departed bishop. On Sunday, after late liturgy, the second pannikhida was conducted. Before the service, however, Bishop Kyrill spoke on what a great archpastor Vladyka Anthony was, how he was able to forgive and how the late Vladyka personally helped him understand the concept of Conciliarity in the Church. The third pannikhida was served that evening. It is worth noting that the eldest clergyman of the Russian Orthodox Church Outside of Russia, Protopriest Elias Wen, participated in this service. Fr Elias, 103 years of age, had almost not attended services anymore, but made a special effort to come and pray for Archbishop Anthony, whom he loved and respected. The clergymen read the Gospel over the body of the late Vladyka all night. 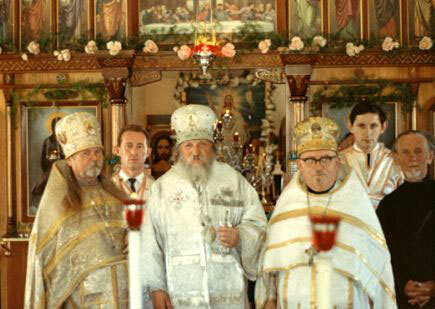 On Monday, September 25, at 9 am, the funerary liturgy was served, attended by an enormous number of clergymen of the Diocese, and that evening, a parastas [great pannikhida] was performed, headed by Bishop Kyrill along with Bishop Jovan of the Serbian Orthodox Church, the clergymen of the Diocese and seven Serbian priests. Protopriest Stefan Pavlenko gave a eulogy. He said that this was a schema-monk who lay before the worshipers. Vladyka Anthony did not tell anyone that before becoming a bishop, he assumed the Great Schema, but he led his life as an austere monk. During his address, Bishop Jovan emphasized that although we lost an archpastor, we gained a new intercessor at the Throne of the Lord, and that we must not mourn that we lost Vladyka Anthony, but instead thank God that we had him at all. The multitude of worshipers silently, slowly, with a feeling of gratitude yet sensing that they were now orphaned, approached the coffin of their archpastor and kissed his hands. At this time, the singers sang various Paschal sticheria, and the parishioners joined in this singing and the final words: "Christ is risen from the dead, by death He conquered death, and to those in the graves He granted life!" The Cathedral's Protodeacon, Fr Nikolai Porshnikoff, appointed to his position by St John was in the hospital all week, and learning of the death of Vladyka Anthony, with whom he had served for 32 years, grieved that he could not participate in his burial. He even questioned why the Lord punished him so. On the day of the parastas and the bidding farewell to Archbishop Anthony, Fr Nikolai was undergoing a medical procedure, and was under general anesthesia. At about 8 pm, a doctor unexpectedly told Fr Nikolai that he was being sent home. At this very moment, some visitors came to see him and he asked that they take him home to get his cassock, and then to the Cathedral. And so Fr Nikolai entered the Cathedral near the end of the service, asked blessing to don his vestments, and then intoned the final litany of the parastas for his archpastor: "Let us again pray for the newly-departed servant of God Archbishop AnthonyЙ" and then "Eternal Memory." Was this not a miracle, a mercy of God? At around 10 pm, the coffin with Vladyka's body was carried around the Cathedral he loved so much and placed into the hearse. This hearse circled the block once more and then departed for the airport. The clergy and worshipers watched the departed hearse for a long time. Vladyka left our Cathedral for the final time. The funeral and burial service, as Archbishop Anthony requested, were conducted at Holy Trinity Monastery in Jordanville. Ten clergymen and some 50 people from the Western American Diocese were able to participate in the services. The body of the newly-departed arrived in the monastery on the day of the Elevation of the Cross. That evening, a funerary vigil was performed; the monastic brethren read the Gospel at the coffin all night. On Thursday, classes at the Seminary were canceled and a funerary liturgy was conducted. At the end of the service, a great number of clergymen and faithful from many cities and states all across America arrived, even clergymen from Australia. After liturgy, the monks gave a memorial trapeza for Vladyka. Because of the great number of worshipers, tables were set not only in the refectory but in the large Seminary Hall. The monastic funeral began at 1 pm. Archbishop Laurus, the Superior of the Monastery, officiated, along with Archbishop Alypy of Chicago and Detroit, Bishop Kyrill of Seattle, Bishop Gabriel of Manhattan, and around 25 priests. Bishop Evtikhii of Ishim and Siberia was in attendance, as was Bishop Mitrofan of Boston and another 25 priests. Several eulogies were given at the service. Archbishop Laurus described the image of Vladyka Anthony, outlining his life and sharing some personal memories of him. Protopresbyter Valery Lukianov called Vladyka Anthony "a Bishop of the people," just as St John of Kronstadt was a "father of the people." Fr Valery also stressed that Vladyka Anthony more than anyone was the most worthy successor to St John upon the Western American cathedra. After the service, the clergymen, under the ringing of bells and the singing of the irmos "Helper and protector," thrice circled the monastery cathedral with Vladyka's coffin. It was a brilliant day, the sun was setting, a breeze blew gently and the trees bore their autumn colors. Vladyka Anthony was buried in a grave behind the cathedral next to Metropolitan Philaret. The clergy and faithful did not leave for a long time, and sang prayers around Vladyka Anthony's grave, and, as they had in San Francisco, ended with the sticheria of Pascha and "Christ is risen!" Everyone departed with a quiet joy and peace in their souls.